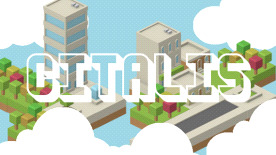 Citalis is a fast paced, arcade like city simulation game where you must manage your city and businesses to make a profit and avoid bankruptcy at all costs. Using Commercial, Residential and Park districts you must balance all the core aspects of a happy and successful city - such as building businesses, housing, maintaining roads, monitoring water levels and ensuring the city remains beautiful at all times. But beware, if your city becomes unhappy your businesses will start partaking in criminal activity leading them to be shut down. Failure to monitor water levels may lead to a drought to stop the city functioning properly or a flood to destroy housing, landscaping and roads. Now with 3 new target modes to challenge different aspects of your city building! No limit on number of districts - create cities spanning thousands of blocks!